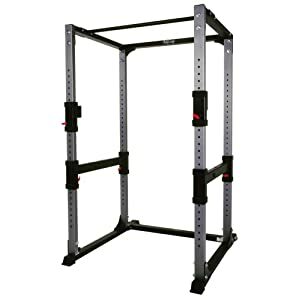 A quality power rack is an essential piece of home fitness and exercise equipment if you are working out with squats or heavy bench poundages. The BodyCraft F430 Power Rack is the sturdiest one I have found. It is constructed with 2" x 3" steel tubing, and the pair of adjustable spotter arms and bar catches make solo workouts safe and efficient. Anyone who's ever had to roll an Olympic bar off them when they've "missed" a rep in the bench knows the value of a power rack. This is one piece of home fitness and exercise equipment that will give you peace of mind when working out alone. One nice feature of the BodyCraft F430 Power Rack is the straight pull-up bar that is built in. Guys who do hanging ab work will like this far better than cheaper racks with curved pull-up bars. One recommendation I would make is to spend the money for an extra set of J hooks, because one they are on, you cannot move them front to back...or put them on other support legs. The BodyCraft F430 is a solid power rack, and will probably last the longest of all your home fitness and exercise equipment.